Happy New Year of the Rooster! May it bring you and your family peace, happiness, and prosperity! Welcome to the second issue of the Yee Fung Toy Global Village Voice, an electronic newsletter for the World Yee community. 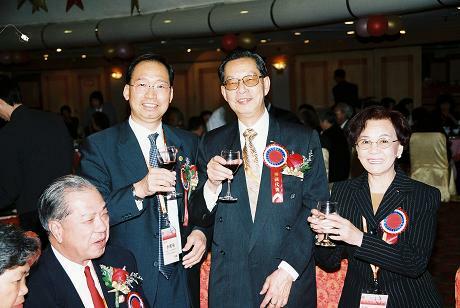 As promised, in this issue we are featuring stories and images from the Second World Yee Family Convention, a successful and memorable event held in Hong Kong in November 2004. 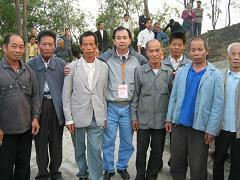 This Convention has had many significant impacts on the Yee Family and its members worldwide, on both an organizational and a personal level; e.g., this newsletter would not have been launched without the support by World Yee for a website, and many members would not have had the opportunity to visit China in general and their ancestral villages in particular. Here are some examples. While attending the First World Yee Convention 4 years ago, I came home to the village of my childhood 45 years after I left China. After the Second Convention, Frank Yu went looking for his ancestral village 50 years after leaving it (see Frank's Incredible Roots Seeking Adventure in this issue). Before arriving in Hong Kong for the Second Convention, a group of us from Vancouver toured Beijing and the Shanghai area, the first such trip in China for most of us (that trip is described in Martin Yee's webpage). Readers may remember an email query from Dr. Albert Yee of Missoula, Montana, printed in the last issue. We have since followed up with Albert about his new book "Yeee-Hah", and we are pleased to print a report on the book and its author in this issue. The Seattle Yee chapter will help present Dr. Yee in an evening lecture comparing Chinese and Jewish experiences. Ah, such is the power of the Internet to draw people together! Thanks to Melinda Yee of Sacramento for her helpful formatting suggestions. A big thank you to my Chinese Editorial Team in Vancouver: Martin Yee and Wing Yee, for the challenging task of translating many articles to Chinese under a tight schedule. U.S. Grand Elder Damon Yee was elected Chairman of the World Yee Family Association. The Third World Yee Convention will be held in Los Angeles in 2006. The World Yee website was established and a World Yee Web Committee formed. View more photos from the Convention album. 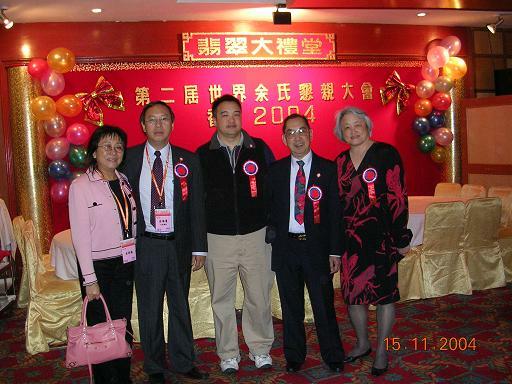 Five members of the Seattle Yee Family Association attended the 2nd World Yee Convention in Hong Kong from November 14-16, 2004. A total of 400 Yees from the United Stated, Canada, Thailand, Malaysia, the Philippines and Indonesia came to Hong Kong for the convention. Suey Yee, Linda Yee, Steven Yee, Fred Yee and Clara Cheung of the Seattle chapter participated in the convention activities. Fred Yee attended the delegate meeting, assisting Jim Yee of Vancouver, B.C., Canada in presenting the World Yee Website Project to the convention delegates. The project was officially approved during the delegate meeting. Among the many activities was a visit to the Elegantia College in Sheung Shiu. The construction of the college was made possible with a Hong Kong $9 million donation from the Hong Kong Five Tong Yee Association.. The visit included attending the opening ceremony of the college which has attained excellent academic achievement. The college facilities are well built and represent a true pride to Hong Kong and visiting Yee members. Other activities during the convention included the opening and closing banquets, the touring of the Wong Tai Shin Temple and other local attractions. Following the convention in Hong Kong, about 300 Yees continued to go into mainland China to visit Toy San, the home and ancestral place for many of the Yees around the world. The three day visits, November 17-19, included visits of several local schools built with donations from Yees around the world. The visits were joyous and exciting, especially to those who visited Toy San for the first time. My father passed away 51 years ago. He would have been 104 years old by now. I vaguely remembered what he told me about his village being famous for sweet oranges. He mentioned the name of the village repeatedly and the inscriptions on the village archway, upon which he would partially adopt for naming us. I do know, however, my ancestors were from Xinhui but I cannot tell you what village even if you pay me. Last time I uttered that name was more than half a century ago. Who cares! I left Hong Kong in 1958 as a teenager. I never thought that my village name would resurface after all these years. Following is an incredible account of my roots seeking adventure. 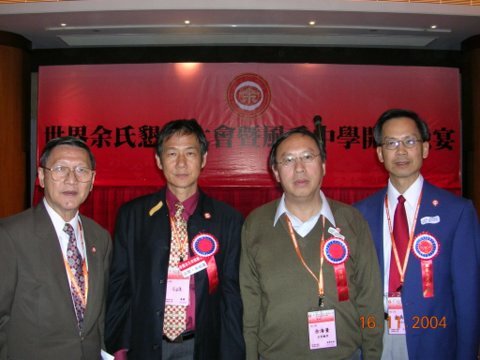 The Second World Yee Conference was held in Hong Kong, November 14-16, 2004. After that, more than 400 Yee delegates and families boarded the hydrofoil to Zuhai. Being the Yee Fung Toy Houston official, I was informed the night before that I would be among the very few privileged to pay respect to the Five Yee Elders Tombs at Lotus Pond in Xinhui. It dawned on me that it would be once in a life time opportunity for me to check out my family roots. I thought about that idea on the bus over. But where would I start? Being a Yee would help. There, everybody is a Yee. Our bus arrived late in the afternoon. We were greeted by enthusiastic villagers at a foothill, amid cheers and fire-crackers. We were fore-warned we would have to climb 252 steps to visit the tombs. No sweat, it took me but a few minutes to get to the top. I was swarmed by a group of heavily sun-tanned villagers. Then one of them asked me for my village name. Without hesitation, I blurted out Chung How Village. How on earth would I remember that, I still cannot explain! May be my old man was prompting me from above! Upon hearing that, he told me that he happened to be the Chung How Village Chief Executive. I told him my father旧 name. One of his underlings told me that my ancestral home had long been demolished. The Chief did not have a business card but he told me that I could contact him via his friend, owner of the only lumber yard at Lotus Pond. eter Yee of New England took pictures for us. Chief, wherever you are, please contact me. You have my e-mail and address in Houston. Incredible! So much for roots seeking; no problem, done in a flash! The following reports of activities were picked up from websites of Yee Fung Toy Association chapters in North America. The Vancouver chapter held its Christmas party on Sunday December 19, 2004. We were entertained by our Women Singers, a group of mostly seniors who had started singing together this year at the Vancouver chapter. After a delicious buffet lunch, we held a draw for prizes. Everyone had a good time. Thanks to all the volunteers who helped organize it, and to our Women Singers. 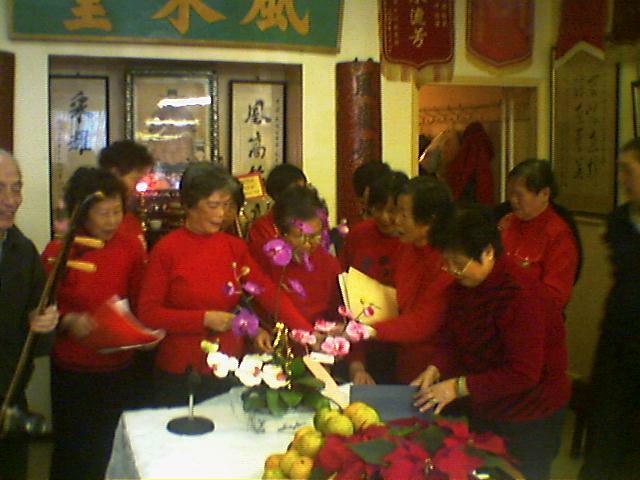 On January 17, 2005, members of the Seattle Chapter of the Yee Fung Toy Association joined 400 plus community members from the Seattle Chinese and Asian community at a fund raising auction dinner at the House of Hong Restaurant in Seattle. Many Seattle area Chinese family associations were among the sponsors of this charitable event. Shek Jing Yee, Seattle chapter Vice-President, coordinated efforts for the Seattle Chapter to sponsor a full table at the event which was attended by ten chapter members. The dinner was a success and over $80,000 US was raised from auction, donations and dinner tickets proceeds. Among government leaders attended the event were the newly elected Washington state attorney general and King County executive. Representatives from World Vision were present to give the latest update on the relief efforts for the tsunami victims. We were extremely saddened and shocked to hear about the quake and tsunami disaster in South Asia one day after Christmas. 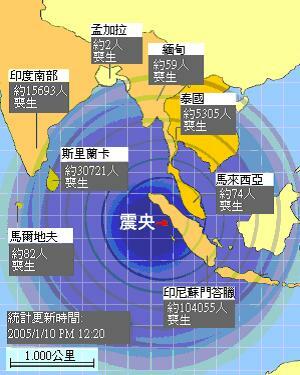 We immediately contacted Yee Family members in that region: Thailand, Malaysia, and Indonesia. Who would have guessed 6 weeks after meeting them at the World Yee Convention, they would return home to face this unprecedented disaster. We were relieved to hear that they were not directly affected. We participated in the Vancouver Chinese community fundraising effort by contributing $500 from Canada and $200 from Vancouver, as well as attended a fundraising dinner organized by the Chinese Benevolent Association of Vancouver on February 13. On Sunday, January 23rd World Yee President, Damon Yee, celebrated his election by inviting Yee Fung Toy Family HQ board of directors to a party, along with the Hop Wo board of directors, Sacramento Yee, Yee Shew Yan Benevolent, and the Damon and Angie family. In attendance was California State Assemblyman Leland Yee, Speaker pro Tempore, who remarked that President Damon Yee told him to just come and enjoy the wonderful dinner. And he was right, it was a great dinner! Pictured from the left: Advisor Larry Yee (who contributed the text and photo for this article), Advisor Joseph Yee, Sacramento President Sherman Yee, Advisor Frank Yee, Western Vice Grand President Gene Yee, Western Grand President Art Yee, Mrs. Angie Yee, World Yee's President Damon Yee, Elder Jack Yee, Past Vice Grand President Shui Young Yee, Hop Wo President Jak Min Yee, HQ's President Wesley Yee, Advisor Paul Yee, HQ's VP Phillip Yee. To see more pictures from the dinner, please visit our webpage. Yeee-Hah! : Remembrance and Longing by Albert H. Yee has been published in early January 2005. One theme of Yee's 11th book is that public attitudes towards Asians are so prejudiced that no other peoples, except the Jews, have faced stereotypes that distort their true being and merits as much. For more info, see the publisher's synopsis. The author also supplied additional biographical material for our readers. Following promotion to full professor at Wisconsin-Madison in 1970, Dr. Yee won a Fulbright lectureship in Japan in 1972, a stimulating year indeed. He had advised White House planning for President Nixon's February 1972 trip to Beijing. Materializing into the best result of the historic event, he proposed a US/PRC cultural, educational, and scientific exchange agreement. For decades, Yee's idea benefited huge numbers of U.S. and China artists, athletes, businessmen, scholars, musicians, etc. Also in 1972, Yee became the first U.S. social scientist to visit the PRC, which he found in tumult and scholars oppressed during the Cultural Revolution. For all he did to aid them, China's Academy of Sciences and Psychological Society honored him in 1980 as their first "Foreign Expert" in psychology from the U.S.
After years as a dean at CSU, Long Beach and elsewhere, Yee went to Asia where he worked for long. He taught psychology in China and at the Chinese University of Hong Kong, and the National University of Singapore. Because of his Chinese American background and wealth of experiences in Asia, including 1947-48 study at Lingnan and Korean War service, his chief interests lie in cultural psychology. Retiring in 1995, he resides in Montana and recently became a member of the Seattle Yee Family Association.. A widower, Albert is the father of a surgical oncologist daughter and a U.S. diplomat son. Dr. Albert Yee is an excellent speaker with a wealth of experience and research to draw on. He will be speaking at the Wing Luke Asian Museum in Seattle on March 22, on "Wonton and Kreplach: Comparing the Chinese and Jewish Experiences". For details visit the Seattle Yee website. The next issue of the Yee Fung Toy Global Village Voice will be published in mid June of 2005, featuring celebrations of the Year of the Rooster and the new spring at Yee Fung Toy associations around the world. 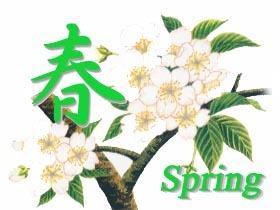 Please submit your articles to the Editor via email (editor @ yeefungtoy.org) or postal mail (The Editor, 226 East Georgia Street, Vancouver, B.C., Canada V6A 1Z7) by May 15, 2005.